This month's project was inspired by Flag Day which is June 14 in the US. It commemorates the adoption of the flag of the United States in 1777. It got me thinking what thinking about what interesting objects flags are. My kids had a small book of flags from around the world and I used to love to look at it. The project uses the index card accordion book; the 3 x 5 cards are a perfect flag shape. 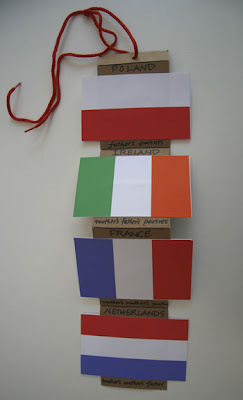 I made my flag book about my family heritage with a flag for each country of origin. Since there were four different countries, I used one accordion section and four cards. I used the side panel of a grocery bag cut in half the long way for the accordion. I used index cards for the pages but you could also cut recycled paper or cereal boxes to size. I glued another set of cards to the back for information about the flags: the meaning of the colors, when they were adopted. You can adapt your book to however many flags you are using. The accordion sections are in multiples of four pages. I think it is easiest to always make sections of four and cut off any extra. * Class or Family Book of Flags: Each person designs his or her own flag. You might want each person to make a large one for display and a smaller one to put in the book which would hold one from each. Vexillology is the study of the flags. This site from the North American Vexillological Association uses examples to illustrate the principles of flag design. Another use for the flag accordion book could be the six flags that flew over Texas throughout history. Anyone else have ideas?